When last we wrote, we had just returned from our initial shakedown cruise on hull number 1 of the Sabre 45 Salon Express. 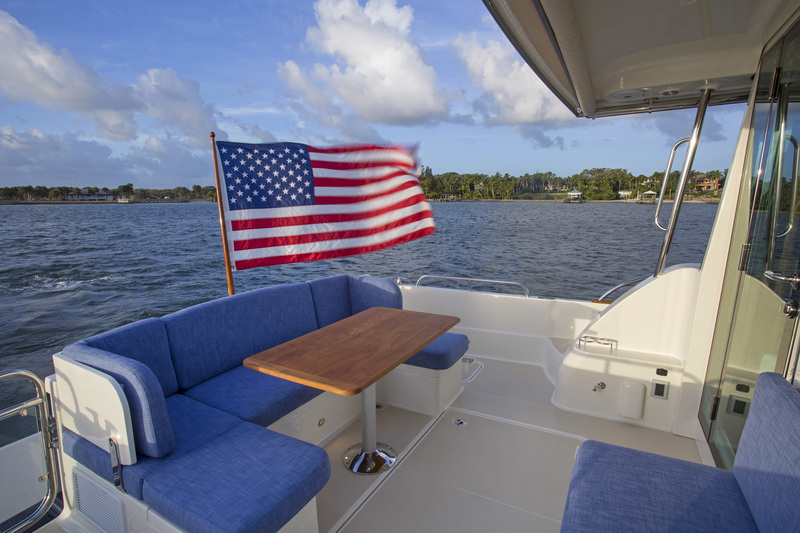 While that was very successful, the boat was designed for a lot more than a nine-day cruise along the Florida coast. So to make sure we put her to the test, we traveled with our yacht club to the Bahamas for an extended cruise. Seven islands, eight ports, and 27 days later, we can report that Q.E.D. did everything she was designed to do. While we have cruised the Northern Bahamas on several occasions on our Sabre 38, those trips were two weeks or less in length. This time, we had to provision differently given our itinerary. The storage capacity on board was unbelievable. With the space in the pantry, below the main cabin, and in the utility room coupled with the two refrigerators and two freezers, we were able to stow enough provisions to probably last four months and enough drinking water to last at least two. With a decent weather window, we left Stuart Florida en route to West End. It was a reasonable crossing, although we are still waiting for the “smooth” water that we hear some have had for their crossing. Once we arrived, the rain started in earnest and continued for most of our two-day stay. The entire time we were out, the weather was hot even for this time of year. Even when we had to spend time inside the boat, the salon express design meant we never felt confined. We left Old Bahama Bay en route to Green Turtle. The seas outside of West End were high and confused until we entered the bank South of Memory Rock. These were the roughest seas we had experienced in the boat so far. The rest of the trip to Bluff House was uneventful. After three days there, we traveled to Hopetown where we stayed six days spending time at Tahiti Beach, Pete’s Pub, Man O’War cay, and explored the area. We then traveled to Harbour Island via the Devil’s Backbone. This is a cut North of Eleuthera which has a reputation of being extremely difficult to navigate. We hired a pilot to bring the group through but decided that we could have been just as safe following the details on our Volvo/Garmin glass cockpit. In fact, we decided to do it ourselves when we left. The marina assigned us a slip which was parallel to the coastline. All day long and for part of the night, there were boats on plane just off the marina. Other boats that were in slips like ours, rocked heavily all the time. We turned on our Seakeeper and Q.E.D. just settled in. The pink beach at Harbour Island is terrific and we spent a good deal of time on it over the next six days. As in most of the Bahamas, there are very nice resorts close to really poor neighborhoods. The next passage, to Highbourne Cay in the Exumas, was probably the most difficult due to the route across areas which had scattered coral heads. When we arrived, we fueled and again found out that we had used less fuel than any of the other boats, including the smaller boats. This is a wonderful island, well worth the trip: great service, protected marina and absolutely gorgeous grounds and hiking trails. Next we traveled to Staniel Cay. This is one we would miss next time as the marina is falling apart and exposed to lots of wash and the boats are all side tied to a long dock. Again, the Seakeeper kept us safe while other boats were rocking so badly that they had damage. We did get to feed the swimming pigs, iguanas, swam with nurse sharks and snorkeled Thunderball grotto. From Staniel we went to Nassau for one night dockage and to fuel. Nassau is also a stop we could miss. We then on to Chub Cay the next morning. This has been completely rebuilt with outstanding floating docks, reliable power, and really nice facilities with an infinity pool overlooking the beach. Our last stop was Lucaya on Grand Bahama. One night there and then home. We traveled more than 700 miles, used 948 gallons of fuel including running the generator when underway, and had no real boat issues. We cruised in the mid-to-upper 20 knot range the entire trip. 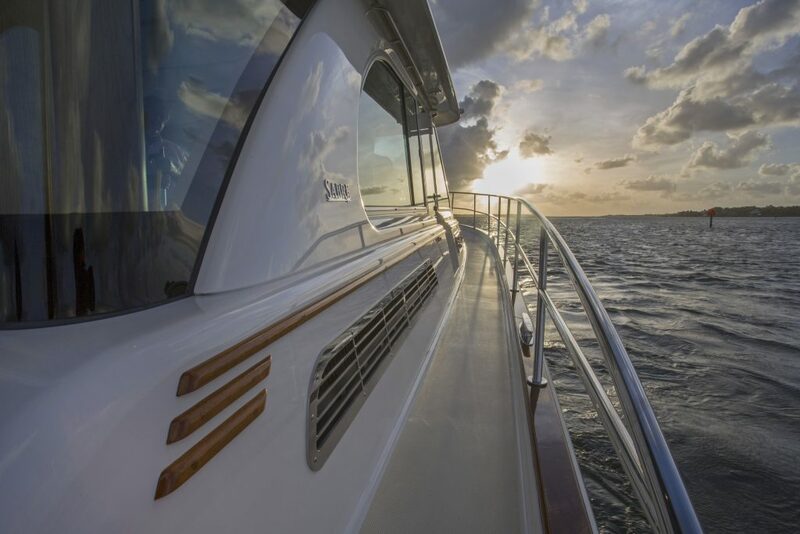 The Volvo IPS 600’s performed flawlessly; the Volvo/Garmin Glass Cockpit provided us with great navigation and engine management tools, and the Sabre 45 did everything we asked her to. In fact, we came back with enough food and water (and even other beverages) to go back out for another month or more. The Sureshade proved to be a real asset in helping to protect us from too much sun and the window blinds not only gave us privacy but also kept the boat cooler. Even with significantly hotter weather than normal, the air conditioning kept us comfortable the entire trip. We had enough water pressure to use both showers at the same time and plenty of water aboard. The cruise was so much fun and we had so much food left, that we left on cruise number three, a week in the Florida Keys. Loads of fun and again the boat was terrific. Eight for cocktails in the salon proved to be no problem at all although a dent was made in the contents of the wine cooler. And the salon table worked fine for six for a formal dinner. We now have almost 100 hours on the engines! When we started this process three years ago, we never thought that the boat could meet the objectives so completely. Thanks again to all at Sabre and Volvo for providing us with this traditional example of modern technology and craftsmanship at its best. 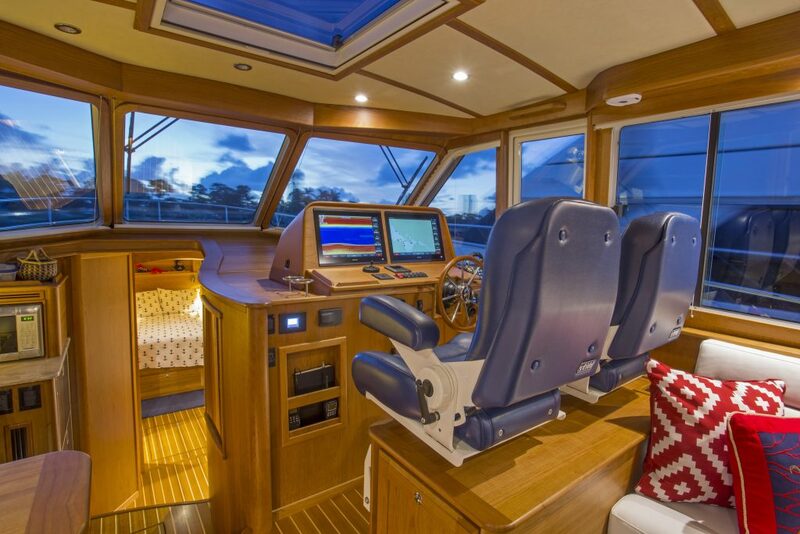 This entry was posted in Sabre Yachts Blog and tagged boat, boating, cruise, sabre 45, sabre yachts, shakedown cruise, trial, yacht, yachting. Bookmark the permalink.